Most providers of valuation management software claim that their platforms are fully automated, but many of these platforms still require manual input from users in order to trigger important actions – such as file delivery. This inevitably slows your processes and delays the closing of your loans. Only one valuation management platform on the market truly provides the FULL automation you're looking for – eTrac and its workflow engine. eTrac's Workflow Engine is a status-driven tool that automates every step in your valuation process based on the statuses of your appraisal orders. Numerous workflow actions are available and can be built around any standard or custom appraisal status that's been created. Thousands of workflow configurations are available within the tool. Some of the more popular workflow actions include: Email, Deliver Files, Notifications, Auto-Assignments, and more. 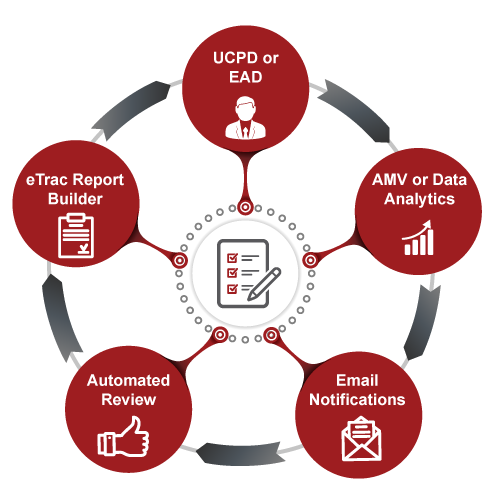 eTrac's Workflow Engine also includes specialized workflow actions for users of our LOS integrations and certain Web Services, including Client API Integrations and Vendor API Integrations. Workflow actions can be configured to process once, always, or only when the order status changes, giving users plenty of options and full control. Simply put, no other platform on the market has such a tool or unique functionality. To receive our latest updates and resources, including free whitepapers, checklists, etc. Fully customize and automate email or file delivery to multiple recipients upon a designated status change. Schedule automatic notifications and reminders to your appraisers based on a set time interval between status updates or since a status update last occurred. Send specialized reports to selected recipients as attachments upon a designated status change. Assign orders to engagers, reviewers, or supervisors automatically upon a designated status change. Give permission to selected appraisers and other users so they can view files automatically upon a designated status change. Automatically run a MARS® appraisal review (or other review products) on the most recently uploaded file upon a designated status change. Automatically run specified Data Analytics products upon a designated status change. Forward the most recently uploaded UAD XML file to the UCDP or the EAD automatically upon a designated status change. Increases productivity by helping your staff complete routine tasks more quickly. Decreases cost by shortening order turn-times and by only ordering additional review or data products when necessary. Reduces errors by letting eTrac shoulder the responsibility of common tasks.